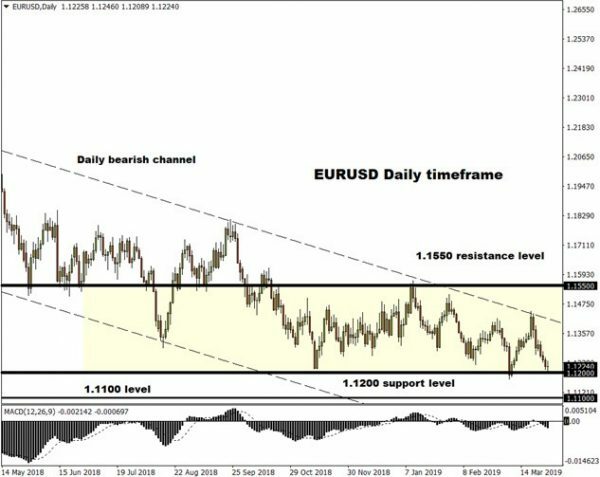 This could potentiallybe digested as a bizarre headline for the Euro, but the risks of the EURUSD hitting levels close to parity in 2019 are arguably just as strong now as they were a few years back when anticipation had reached fever pitch that the Euro would fall to 1:1 against the USD. This long-awaited move never occurred, but we should not discount the concerns over the health of the EU economy, with recent data showing that there is limited reason to be optimistic on the Euro. The chorus of concerns around slowing world growth is getting louder by the day, and Europe is going to stand at the epicenter of fears that a world economic slowdown is approaching. What makes matters worse for Euro investors is that when the slowdown in Europe becomes apparent, there is little to nothing that the European Central Bank (ECB) will be able to do at this stage to reinvigorate economic momentum. Similarly to the Bank of Japan (BoJ), the ECB has little ammunition left to ease monetary policy and any attempts to do so will only make the market even more concerned over the level of worry that ECB officials have on the economy. When you combine this pessimistic outlook with the unknowns around what the future of the ECB will look like once President Mario Draghi steps down later in 2019, alongside prolonged anxiety that the face of Europe is set to change with Merkel’s days as German Chancellor numbered and more than 18 weeks of consecutive protests in France, there is very little reason to be optimistic on the Euro. The second quarter of 2019 is probably going to continue on much of the same theme from the previous quarter, where bounces higher in the Euro will be dependent on rounds of softness in the Greenback. 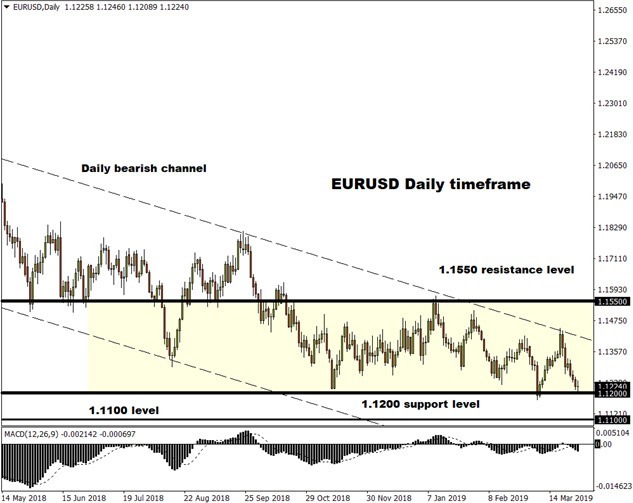 This represents a dangerous position for potential Euro bulls, because there are limited buyers in the market. Europe not only has its own political risks and structural issues, but the economy also stands in the crossfire of the protracted trade tensions between the United States and China. Another aspect that appears as left-field but nonetheless needs to be taken into account, is that the EU economy is near equally as unprepared to face negative repercussions from a potential no-deal Brexit as the United Kingdom. One additional spanner in the works for the EURUSD is that global economic concerns have historically benefited the Greenback. I will not rule out the possibility that the Dollar Index will attempt to climb to a new 2019 high, perhaps even back towards the 100 level in the event of a global economic downturn. While there has been a near-term shock on the Dollar following the Federal Reservespectacularly making a U-turn from its interest rate ambitions during its March policy meeting, few have yet to speculate that the reversal from the Federal Reserve could be because they are aware of something that is coming our way, which we are yet to see. 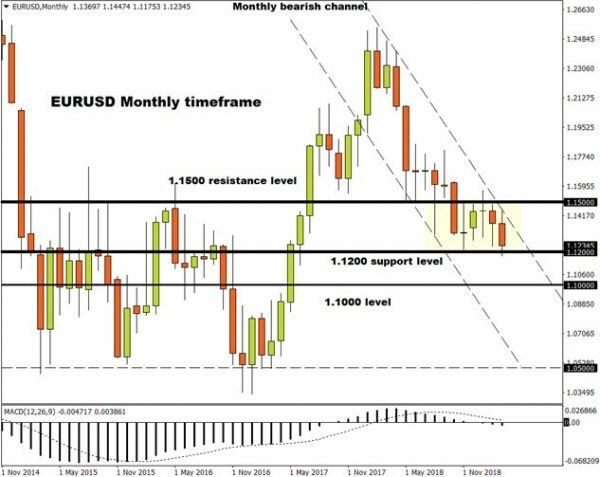 Focusing on the technical picture, the EURUSD remains in a steady downtrend on the monthly charts with consistent lower lows and lower highs evident. 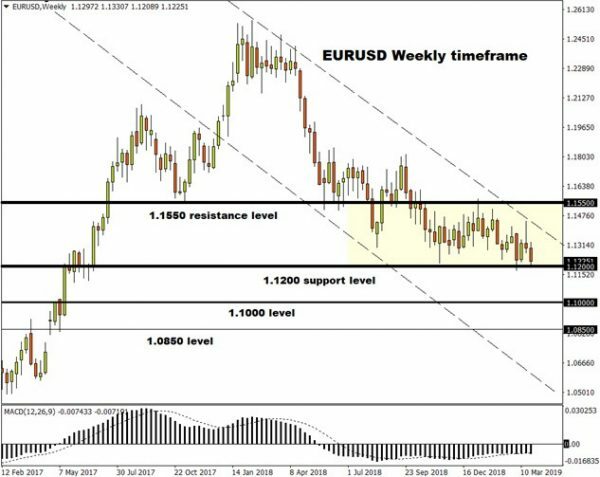 The EURUSD has overall traded in a very narrow range between 1.15 and 1.11 since October 2018. 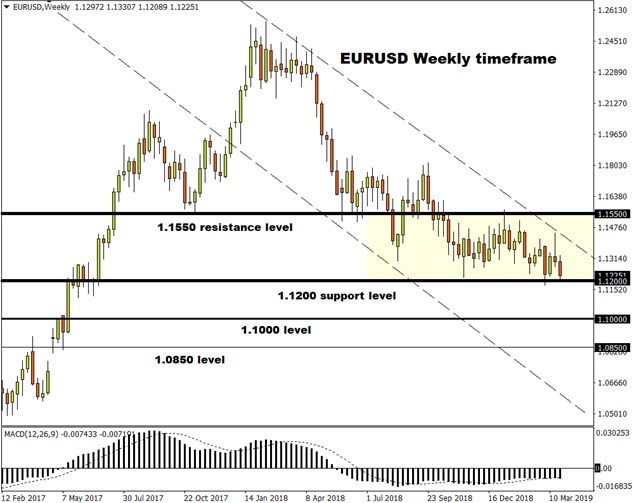 A potential weekly close below 1.1150 could be viewed as an indication that the EURUSD would be at threat to weakness below 1.10 for the first time since May 2017. If the EURUSD manages to close below 1.10 on a monthly basis, this could encourage a series of headlines that bearish acceleration in the Euro might meet a speed not seen since initial concerns years back that the Euro would fall to parity against the USD. The FXTM brand provides international brokerage services and gives access to the global currency markets, offering trading in forex, precious metals, Share CFDs, ETF CFDs and CFDs on Commodity Futures. Trading is available via the MT4 and MT5 platforms with spreads starting from just 1.3 on Standard trading accounts and from 0.1 on ECN trading accounts. Bespoke trading support and services are provided based on each client's needs and ambitions - from novices, to experienced traders and institutional investors. ForexTime Limited is regulated by the Cyprus Securities and Exchange Commission (CySEC), with license number 185/12, licensed by South Africa's FSB with FSP number 46614, and registered with the UK FCA under reference number 600475. FT Global Limited is regulated by the International Financial Services Commission (IFSC) with license numbers IFSC/60/345/TS and IFSC/60/345/APM.